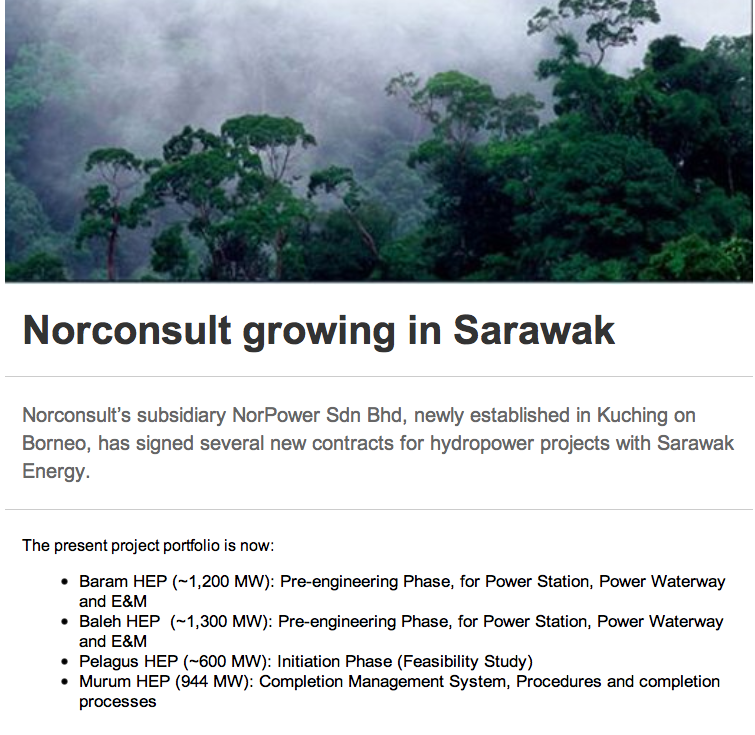 Suara Sarawak: PR Blunder By Norway’s Norconsult? The delegation of natives who took the trouble to visit Europe to explain the widespread popular resistance to SCORE has received an arrogant rebuff from the Norwegian company Norconsult. In a letter that could have been written by Sarawak Energy’s own Norwegian PR disaster, Torstein Dale Sjotveit himself, the CEO of the major energy consulting firm declared he was not prepared to meet the Sarawak natives, who had travelled all the way to Oslo to put their case. Norconsult’s President and CEO John Nyheim declined to meet them, because, he said, he had already satisfied himself that his company’s work in Sarawak had nothing to answer for. It was a startling departure from the normal present day handling of sensitive corporate social responsibility issues by major companies, who usually take trouble to show a caring and conscientious approach to these matters, especially when they are operating in foreign countries and delicate environments. 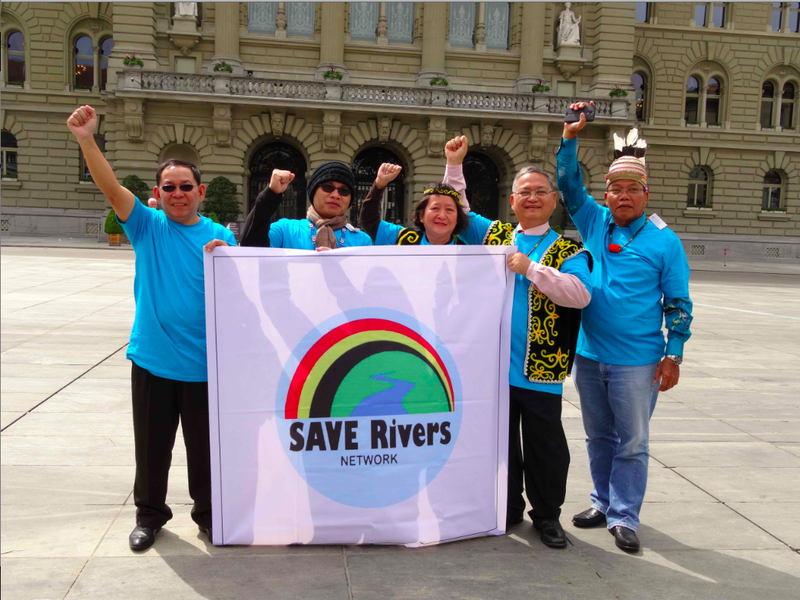 Switzerland’s ABB provided a textbook example of how to receive such petitions just last week, when officials entertained the Save Rivers delegation, listened to concerns and agreed the company would review its position regarding any work in Malaysia in the light of their concerns. No such responsiveness from Norconsult, who made clear they didn’t need to be told! The company, which makes clear on its website that it is “growing in Sarawak” and has “signed several new hydropower contracts in Kuching”, is clearly up to its neck in the planned dams for the SCORE project, despite the failure by the state government to provide either a convincing case for the programme or to achieve popular support. Sarawak Energy have been trying to push ahead with building the mega-dams in advance of impact assessments being appropriately conducted, which is in violation of all proper procedures and the legal rights of the indigenous peoples. In a dismissive letter the Norwegian CEO explained his reasons for not bothering to waste time on Sarawak’s popular movement, which has a petition of 65,000 native names against the development of dams in their territories. Reason number one was that, according to an “integrity due diligence exercise” conducted by the company, it had been ascertained that Sarawak Energy (SEB) has not been convicted of any crimes of corruption! By the same logic Mr Nyheim would not have objected to assisting in the Holocaust under Hitler, because there had been no convictions, so what justification is that? Norconsult is not prepared to take notice of the 200 day blockade to prevent construction of the Baram Dam it has contracts for. It is a wilfully irresponsible stance, given the huge volume of evidence of corruption and malpractice by SEB in its dam building programme and admitted past failures in its corporate social responsibility towards native communities. There has been much talk of improving matters with future dam projects, however there is no sign that methods are improving whatsoever. SEB have been attempting to construct the next Baram Dam in advance of the completion of impact assessments and in direct contradiction of the wish of native landowners and inhabitants. 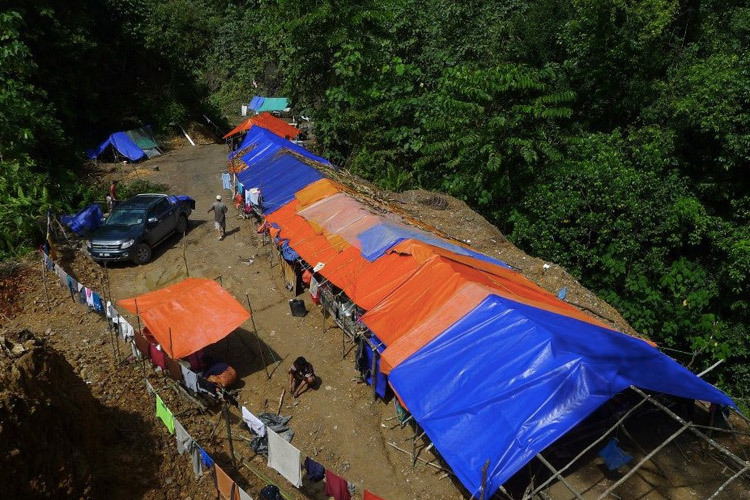 The construction is only being prevented because of a determined blockade by local people now into its209th day [See the Baram Blockade special section on our site]. Meanwile, SEB has been caught attempting to bribe affected communities and to cheat them by conducting false surveys that seek to give the impression of support for the dam by misleading participants. 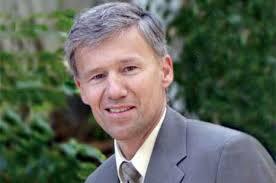 Does Norconsult really need a lesson on commitments that are not worth the paper they are written on? What work has his company done to check whether any of the claims and commitments entered into by SEB have actually been properly acted upon? Moreoever, the ‘tool’ Nr Nyheim refers to in the protocol is merely a guide to best practice and there is no obligation on the signee to act on it! This is one reason why environmental experts the world over have dismissed the Hydropower Association’s Protocol as mere window-dressing, created by the major energy companies who are behind the organisation and who are employing it to regulate themselves. The final reason given by the CEO of Norconsult for his refusal to speak to the delegation of the tribal people of Sarawak is secrecy. Mr Nyheim would do well to recollect that his client in this case is Sarawak Energy, which is owned by the people of Sarawak and that the major stakeholders in the project he is engaged in are the very native people of Sarawak, whose representatives are the very “external actors” who were attempting to meet him this week! Viking Hall of Shame? Nyheim joins Shotveit in giving decent Norwegians a bad name in Sarawak! How dare he resort to arrogant statements about secrecy on behalf of clients, when transparency is the primary duty of his company under such circumstances? It is also, incidentally, a key requirement under the terms of the Hydropower Association Protocols, which he proudly explains that Norconsult is also signed up to. Mr Nyheim has shamed himself by his sloppy, arrogant and dismissive letter towards people who are relying on good practice by his company and who face being flooded from their homes, just so he and others like him can make a fast buck. He should take note that the other major dam building company in Norway, Norsk Hydro, was also approached by Torstein Sjotveit with a view to getting it involved in Sarawak’s dam building plans. Sarawak Report has learnt that after due consideration Norsk Hydro turned down the project on the basis that it was far too controversial to touch. Norconsult will soon be finding out why. 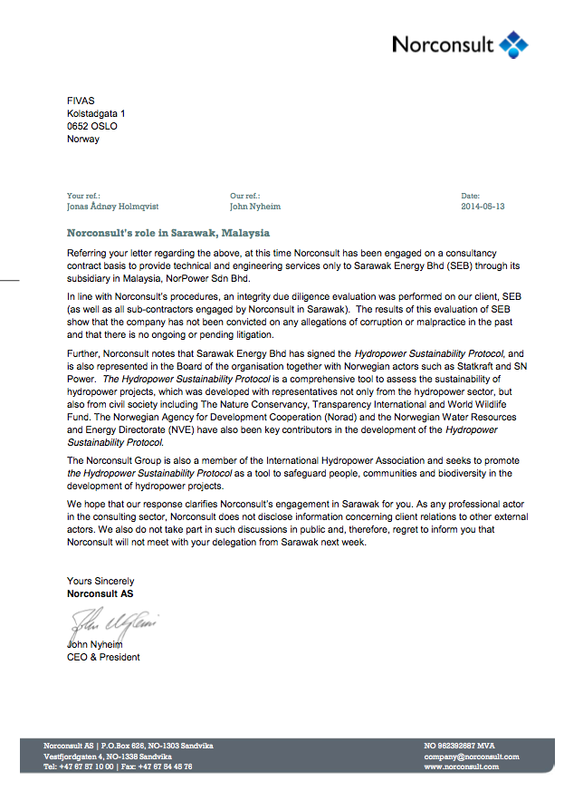 PR blooper – Norconsult’s obnoxious letter to Sarawak’s native representatives.